Vermont Cider Jelly for sale. Buy online at Zingerman's Mail Order. Gourmet Gifts. Food Gifts. Over two quarts of cider squeezed into each little jar. 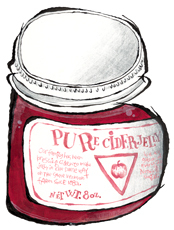 Cider jelly is one of the oldest traditional American products. Our source is a century-plus-old firm, one of the few that still makes it from boiled fresh cider. Cooked down, it forms a thick, sweet, intense jelly. A gallon of this cider jelly takes nine gallons of fresh cider. They use only whole, hand-picked apples to make their cider, a blend of Russets, Baldwins, Spies and McIntoshes along with some wild apples that grow on their land. Use the cider jelly in the same way you’d use any other jelly or as an accompaniment to cheese.